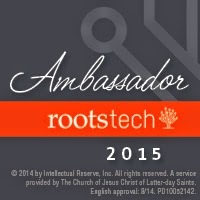 Day 2 of RootsTech 2015 was Friday 13th February - traditionally a superstitious date if ever there was one. Luckily I didn't see anything bad happen on that day! In fact only good things happened as I hope this post conveys. The Keynote session with Laura W Bush and her daughter, Jenna Bush Hager, was a real treat, as I mentioned in my earlier post. The interview of Laura Bush by her daughter, Jenna, showed that even a very well-known family such as theirs can enjoy talking about some very day-today issues. Sadly, the Laura Bush / Jenna Hager session was not made available on the livestream and so no recording is available. Joshua then told his own family story, tracing his family back to his ancestor, William Heaps, who was sentenced to transportation to Australia, and escaped from prison, for stealing cheese, and relating this to his own love of cheese. He then showed how he had used StoryPress to make his own Family History Story. 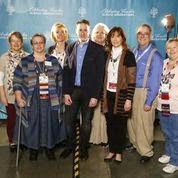 On the right are some of the RoostTech ambassadors backstage with Joshua after his KeyNote session. Later the same day, I attended the FindMyPast lunch during which Ian Tester, Director of Partner Products, provided further details of how FindMyPast's WhoDoYouThinkYouAre? 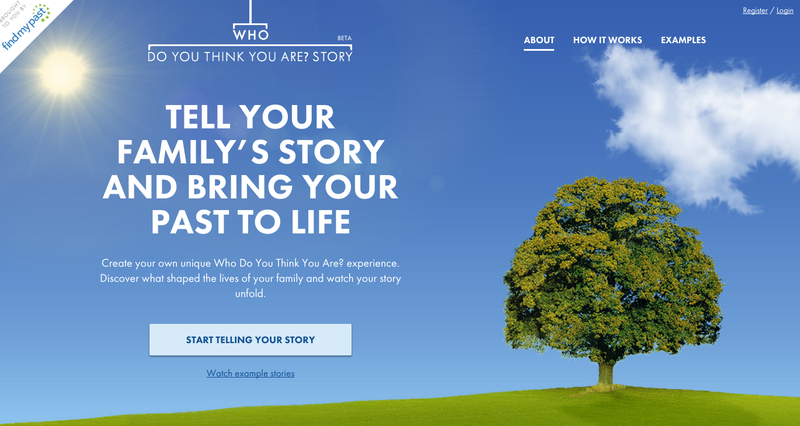 Story can help you tell your own WhoDoYouThinkYouAre? Story. Towards the end of the day I interviewed Tahitia McCabe, Knowledge Exchange Fellow, University of Strathclyde Genealogical Studies Programme. Luckily we just about completed the interview before the evening's "entertainment" of bagpipes started, which would have completely drowned us out! Here I am with Tahitia in the media studio, at the start of the interview. During the interview Tahitia mentioned the University of Strathclyde Summer Institute of Genealogical Studios' summer courses, details of which can be found here. Personally, I'm rather tempted by the 5-day "Practical Applications of Genetic Genealogy" course. Thank you to Tahitia for taking time away from her Strathclyde booth to grant me this interview. I'm tempted by Tahitia's offerings.